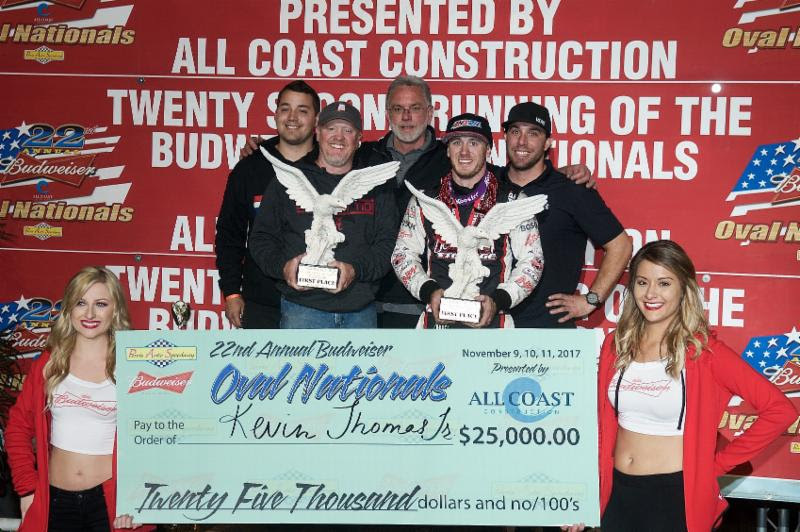 Perris, California.........Kevin Thomas, Jr. unloaded his racecar from his hauler last Wednesday night as the man to beat when practice began for the Budweiser "Oval Nationals" presented by All Coast Construction. When the time came to roll his car back into the hauler following Saturday night's 40-lap main event, the Cullman, Alabama was a richer man - by $25,000 - and had the hardware to show for it after scoring the victory in the 22nd annual event at Perris Auto Speedway. Meanwhile, Chris Windom emerged as USAC's newest AMSOIL National Sprint Car champion, defeating Justin Grant by a mere six points to earn his first series title just one year after capturing the Silver Crown championship. It was in late August that Windom found himself trailing Grant by 93 points and firmly believed his championship dreams had been dashed. "Two months ago, when we got knocked out of the race at Kokomo, I thought our season was over," Windom said. "This means everything. Derek (Claxton), Billy (Grace) and I fought hard all year long for this. With Margo and Kenny Baldwin, we almost did this back in 2011. They've done so much for my career. I can't be any happier doing it for them." Coming into this weekend, Thomas himself was a major player in the points race and was lurking in third, ready to pounce if either Windom or Grant faltered in any form or fashion during the three nights of racing at Perris. 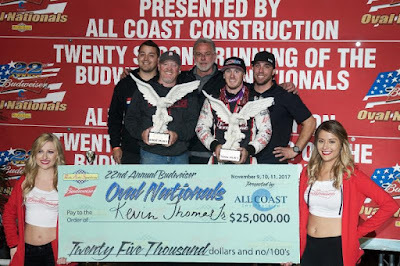 The championship wasn't in the cards this time around for Thomas, but, after being absent for the opening two races of the year, then constructing his own race team in the middle of the season, an "Oval Nationals" eagle trophy on his mantle sure is a shining testament to how strong he and his KT Motorsports/Jeff's Jam-It-In Storage - Abreu Vineyards/DRC/Speedway Chevy were down the stretch. "This is the top of the line right here," Thomas exclaimed. "This is everything you could ever want. You run all year to get your team ready and prepped, wanting to tweak on your cars and try to get faster each and every week, then cap it all off with an 'Oval Nationals' win. That's what our goals are. It's remarkable what our team's been able to do. I'm speechless. I don't even know what to do." Thursday night winner Chase Stockon began the race from the outside of the front row and took the high side around Grant en route to the lead on the opening lap of the 40-lap A-Main where he would remain for the first 17 circuits. Meanwhile, eyes were also affixed to the "race-within-a-race" scenario unfolding behind the leader in which Windom entered the event just 12 points ahead of Grant in the series standings. Inside the top-ten, each spot is worth three points and Windom had to remain within at least four positions behind Grant to maintain his grip atop the leaderboard. By lap seven, fourth-starting Thomas had cleared Grant with a turn four maneuver to slide into second. At the same time, Windom dropped back a spot to fifth after Friday night winner Brody Roa took away the fourth spot. As most of the field ringed around the topside, Thomas found a bit lower line to his liking between turns one and two as he began to hunt down Stockon for the race lead. "It was definitely something I was thinking about earlier when I watched the B-mains," Thomas acknowledged. "I watched R.J. Johnson roll through the middle and turn some pretty good lap times. The Yamaha cars went out there with their skinny tires and I knew that would create a little more moisture in the middle of the track. I thought I could use it to my advantage until it wore out. When I got the lead, I was using it. I was almost worried that I just didn't know when it was going to go away. I felt myself slowing up just a little bit, then I got slid, then I had to start racing a little bit harder." Stockon was able to answer each slider cast by Thomas, but just as Thomas put the move on him between turns three and four, the yellow flag flew for the sideways machines of Tommy Malcolm and Jace Vander Weerd that came to a rest on the front straightaway. It took just a couple laps for Thomas to be in position for another crack at Stockon, which he made stick on the 18th lap with a turn three slider to assume the race lead. Just two laps later, Grant followed suit into second past Stockon for the runner-up spot at the halfway mark. Grant seemed to come alive in the second-half and, when Thomas began to get hung up in lapped traffic, Grant was nearly in position to take advantage. However, with traffic running high and low, the exit ramp was blocked for both and Thomas was able to maintain his advantage. With 10 laps remaining, the table was cleared for a mono y mono shootout between Thomas and Grant sans traffic with a clear track lying ahead of them following Max Adams' misfortune into the back straightaway wall on lap 31. With Windom laying in wait in fourth, Grant found himself in the midst of two separate races, but with the single goal of winning on his mind to maximize points. Grant stuck right on Thomas' tail and was able to slide into the lead in turn three with eight laps remaining. One lap later, Thomas employed the same tactic, but Grant countered underneath Thomas off turn four to lead at the stripe by a half-car length. Grant slid up to the cushion in turn one with Thomas just inches behind. The two made slight bumper-to-bumper contact up top. The déjà vu scene repeated itself on lap 34 when Thomas dove to the bottom of the third turn, slid up and ripped the lead back away from Grant. C.J. Leary was back in third, anticipating his next maneuver in this sprint car chess match, biding his time before sliding past Grant into second in turn one with five laps to go. Grant came right back at Leary into turn three with a slider. The two ran out of room up against the outside turn four wall with Leary kissing the concrete twice, resulting in damage on the right front. With four to go on the ensuing restart, Thomas was merely a sitting duck fully aware what Grant's next move was going to be. Yet, Thomas felt he had a way to retain control of his own destiny on the first and second turn end of the half-mile oval. "The only time I think that I had an advantage is I could kind of manipulate when Justin was going to slide me," Thomas explained. "If he slid me in three and four, it was so slick down there, you couldn't cross under. If I could manipulate where he slid me in one and two, I could get the cross under and get him going down the back straightaway. As much as I wanted to race in front of me, I was still racing behind me. They say that's a big no-no, but these guys are aggressive." As Grant slid past Thomas into one, Thomas did exactly that and turned underneath off turn two to pull even with Grant on the back straightaway. In turn three, Thomas slid evenly with Grant up to the cushion. Grant snagged the curb just enough to hinder his progress and Thomas raced away to a ten car-length lead. Seemingly, throughout the race, each time Grant was able to pick up a spot, Windom was a like a hawk, swooping in to take another spot and get those precious three points back instantly. When one dropped a spot, the other seemed to fall back. With Grant in second and Windom third on the final lap, Windom had some breathing room to spare as Chad Boespflug slipped by for third on the back straight and Windom slotted into fourth. Up front, though, Thomas finished off the biggest payday of his career, winning by a second with Grant, hard charger Boespflug (from 13th), Windom and Robert Ballou rounding out the top-five. "You see the white flag and you're leading the 'Oval Nationals,' you think 'don't screw up,' Thomas said. "Don't get white flag fever. I usually never even think about it. On this night, I did. I'm just glad that it all worked out. There's a lot of great teams out here. To be able to top all of them is pretty special." On the final laps, Windom admitted to tiptoeing around the cushion, hoping to avoid a costly mistake. Like a bend, but don't break defense, every time Grant made a move to pick up a position, Windom seemingly had an answer. Windom knew where he had to be and what it was going to take to secure the title. Many racers such as Windom seem to have an aura that make them seem like superheroes to the average person, as if they have ice water in their veins. However, as Windom admits, a championship on the line can put a racer on edge, amplifying the meaning of a seemingly ordinary task (to them). "I was so nervous today, I don't think I sat still for two seconds," Windom admitted. "I didn't know how good the 11 car was going to be. I just knew where I needed to finish. Starting behind him, I knew where I needed to stay. I got to fourth and I just kind of hung out there until Justin and C.J. got into each other and I got to third. I wanted no part of that battle for the lead. You want to win the 'Oval Nationals,' but I wanted to win a USAC championship. I've won the 'Oval Nationals' before. I was here to win a USAC national championship. And we did it." "It hasn't really sunk in yet," Windom continued. "I think tomorrow it will feel a little better. I've been so antsy and anxious this whole past week, coming here, taking the point lead and trying to maintain it. Once you get there, it's nerve-wracking. I can't be any happier than I am for this team. I know they wanted this just as much as I did. It just means so much." Contingency award winners Saturday night at Arizona Speedway included Damion Gardner (ProSource/Woodland Auto Display Fast Qualifier & Competition Suspension, Inc. 1st Semi Winner), Mike Spencer (Simpson Race Products/Extreme Mufflers 1st Heat Winner), Chad Boespflug (Competition Suspension, Inc./Brown & Miller Racing Solutions 2nd Heat Winner & KSE Racing Products/Saldana Racing Products/Rod End Supply Hard Charger), Richard Vander Weerd (Chalk Stix/Circle Track Performance 3rd Heat Winner), Logan Williams (Indy Race Parts/Keizer Aluminum Wheels 4th Heat Winner), Justin Grant (Keizer Aluminum Wheels Super 6 Dash Winners), R.J. Johnson (Competition Suspension, Inc. 2nd Semi Winner & (Wilwood Brakes 13th Place Finisher). PROSOURCE/WOODLAND AUTO DISPLAY QUALIFYING: 1. Damion Gardner, 4, Alexander-16.550; 2. Thomas Meseraull, 19AZ, Reinbold/Underwood-16.570; 3. R.J. Johnson, 51, Martin-16.690; 4. Jake Swanson, 92, Sertich-16.700; 5. Robert Ballou, 12, Ballou-16.736; 6. Chad Boespflug, 69, Dynamics-16.800; 7. Brady Bacon, 63, Dooling/Hayward-16.852; 8. Logan Williams, 5J, Jory-16.856; 9. Mike Spencer, 4s, Gansen-16.873; 10. Cody Williams, 44, Jory-16.920; 11. Richard Vander Weerd, 10, Vander Weerd-16.942; 12. Austin Liggett, 56, Phulps-16.973; 13. Austin Williams, 2, Jory-16.995; 14. Max Adams, 5m, Adams-17.043; 15. Hunter Schuerenberg, 19s, Reinbold/Underwood-17.080; 16. Danny Faria, Jr., 17GP, Dutcher-17.102; 17. A.J. Bender, 21, Bender-17.127; 18. Isaac Chapple, 52, LNR/Chapple-17.135; 19. Dave Darland, 21K, Kruseman-17.148; 20. Jace Vander Weerd, 88, Vander Weerd-17.203; 21. Michael Pickens, 81, Watt-17.230; 22. Chris Gansen, 4G, Gansen-17.262; 23. Mike Martin, 16, Martin-17.276; 24. Matt McCarthy, 28m, McCarthy-17.285; 25. Tyler Courtney, 23c, TOPP-17.294; 26. Kyle Edwards, 39E, Edwards-17.300; 27. Randy Waitman, 90, Waitman-17.364; 28. Dennis Gile, 13, Gile-17.370; 29. Jeremy Ellertson, 98, Ellertson-17.414; 30. Tommy Malcolm, 5x, Napier-17.452; 31. Verne Sweeney, 98v, Tracy-17.478; 32. Trent Williams, 52v, Williams-17.511; 33. Gary Marshall, Jr., 72, Marshall-18.108. **Meseraull flipped during the second heat. FEATURE LAP LEADERS: Laps 1-17 Stockon, Laps 18-31 Thomas, Laps 32-33 Grant, Laps 34-40 Thomas. FINAL USAC AMSOIL SPRINT CAR NATIONAL CHAMPIONSHIP POINTS: 1-Windom-2290, 2-Grant-2284, 3-Thomas-2232; 4-Courtney-2166, 5-Stockon-2052, 6-Boespflug-1974, 7-Leary-1869; 8-Ballou-1820, 9-Bacon-1765, 10-Darland-1492. FINAL USAC AMSOIL CRA SPRINT CAR POINTS: 1-D. Gardner-1547, 2-Roa-1475, 3-Swanson-1376, 4-Spencer-1212, 5-A. Williams-1058, 6-C. Williams-960, 7-L. Williams-874, 8-Adams-799, 9-Gansen-768, 10-Thomas-756.